The battle for Kunduz: Everything you need to know about the deteriorating situation in Afghanistan. How Have Things Gotten So Bad in Afghanistan? Afghan security personnel keep watch during the final day of a monthlong anti-Taliban operation in various parts of eastern Nangarhar province, on Aug. 30, 2015. With a number of major ongoing international crises, events in Afghanistan have not gotten as much attention as the situation deserves: In recent months, the country’s security situation has dramatically deteriorated. As this week’s dramatic events in Kunduz continue to unfold, here’s a quick overview of what is going on. Afghan troops, assisted by U.S. airstrikes and NATO Special Forces, are currently fighting to retake the northern city of Kunduz, a major transportation hub that on Monday became the first urban area to fall to the Taliban since 2001. The Taliban now controls most of the area and security forces, and civilians have fled to the city’s airport, several miles away. Taliban fighters have reportedly set fire to police buildings and freed hundreds of prisoners from jail. The fall of the city is a major setback for Afghanistan’s security forces, who retreated in the face of a Taliban force they vastly outnumbered. The Taliban also now controls much of southern Helmand province and has launched an increasing number of attacks in Kabul in what has been one of the deadliest annual fighting seasons in years. Last year had already seen a record number of civilian casualties and, after Syrians, Afghans now constitute the second largest population of refugees trying to reach Europe. The Taliban’s momentum has been slowly building over the past few years, but the most recent gains follow the announcement in July of the death of longtime leader Mullah Mohammed Omar. (The reclusive leader may actually have been dead for as long as two years while senior Taliban leaders continued to issue statements under his name.) The announcement of Omar’s death led to the suspension of fledgling peace talks, hosted by Pakistan, between the Afghan government and the insurgents. The recent spate of attacks in Kabul has been attributed to infighting within the Taliban between opponents and supporters of Omar’s successor, Mullah Akhtar Mansour, who had been leading peace talks under the supposed blessing of Omar (when Omar was actually dead). Now, a number of factions within the movement oppose the peace process and want to continue fighting to overthrow the government. Senior Afghan officials have blamed the Pakistani government for involvement in the recent attacks. The Pakistani military has been accused of maintaining ties with the Haqqani network, a Taliban-affiliated militant group that operates in both countries—a charge Pakistan denies. It was reportedly Pakistani officials who informed Afghanistan about Omar’s death, possibly a move to disrupt the talks. With the Taliban’s leadership divided, a number of fighters opposed to Mansour have split to join groups fighting under the banner of the Islamic State, though it’s not quite clear to what extent they’re actually cooperating with the Syria-based group rather than just adopting a popular brand. So even as the Taliban has made recent gains against government forces, it’s had to contend with an insurgency of its own. ISIS is also attacking Afghan government targets, including several military checkpoints this week. ISIS’s emergence may be prompting the Taliban to change its own tactics in order to compete for influence and recruits. In April, it carried out a wave of ISIS-like kidnappings and beheadings of member of the Hazara ethnic minority. The Afghan government is divided. This week’s inauspicious events mark the first anniversary of Ashraf Ghani’s presidency. After an election marked by accusations of fraud on both sides, Ghani formed a unity government with runner-up Abdullah Abdullah last year. The deal avoided another major political crisis and Ghani has forged better relationships with foreign governments than his predecessor, Hamid Karzai, did. But infighting between rival camps in the unity government and uncertainty about Abdullah’s role have hampered the government’s ability to respond to both the deteriorating security situation and a stagnant economy. 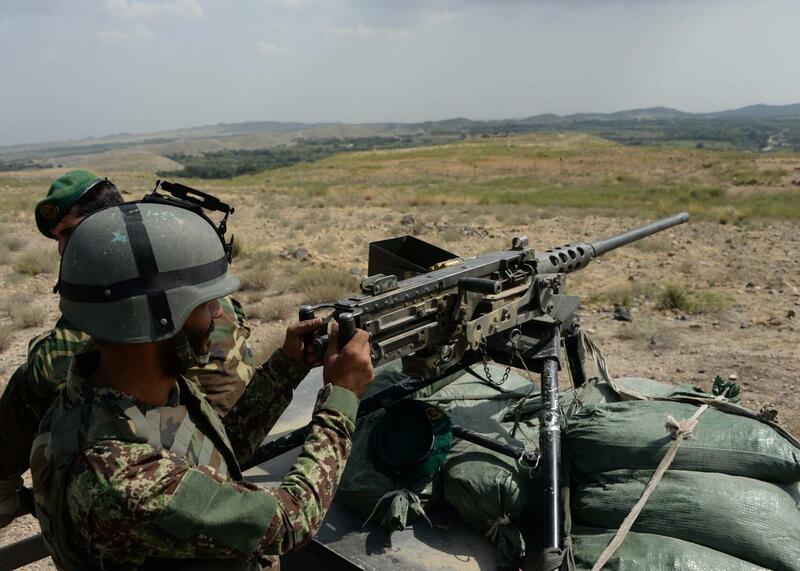 Afghanistan’s security forces have suffered devastating losses in the recent offensive. About 4,100 troops and police were killed in the first half of this year, a 50 percent increase over the same period last year. According to the New York Times, desertion has become such a problem that troops are sometimes barred from returning home on leave. U.S. and NATO combat operations in Afghanistan formally ended at the end of last year. About 13,000 international troops are still in the country, including 9,800 Americans. * They are involved in training Afghan forces as well as conducting limited counterterrorism raids. International casualties are much less common than at the height of the combat mission, but eight U.S. service members have been killed in the country so far this year, and there have been several “insider” attacks on U.S. military bases. In theory, the Obama administration is still committed to a timetable that would see the full withdrawal of U.S. troops by the end of 2016 except for a small security force at the U.S. embassy in Kabul. But the pace of withdrawal has already been slowed, and the events in Kunduz are likely to raise even more doubts about the ability of Afghanistan’s security forces to maintain the country’s security. *Correction, Sept. 30, 2015: This post originally misstated the number of NATO troops still in Afghanistan. It is 13,000 not 130,000.